Last week, Samuel figured out how to climb out of his cot (he was back in the cot for a while after we moved, to makes things easier during the Internet drought of 2008). His room at the new house has a door that he can’t open (actually, no-one can open it from inside), so when he goes to bed he can climb out and complain at the top of the stairs, but that’s it. We’ve been leaving him there, and eventually (sometimes over an hour, sometimes just a few minutes) he gives up and climbs back into bed. He’s learnt not to do this at night, but it’s still a regular occurrence during the day. Today, he had an attempt at a nap around midday, but I gave up after an hour and a half (he was in bed, but not making any attempt at sleep) and let him out for lunch. I tried again an hour or so again, since he was obviously very sleepy. After half an hour it seemed likely that he wasn’t going to sleep (and if he did, he’d wake up too late for dinner and the evening routine, so I headed back to let him out). 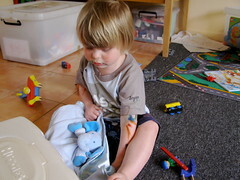 In his room, there’s a box full of craft material (paint, pencils, pens, colouring books, and so on). He knows how to roll it out from under the table and open it, and really likes drawing. He’d helped himself to the paint and done some drawing. Unfortunately, he’s not always accurate, and had painted most of the table. And himself. And then with painted hands walked around his room touching things. Then walked upstairs touching the wall to steady himself (his walking upstairs is good, but he likes to stabilise himself sometimes). Paint on his stuff, paint on the wall, paint on the door, and paint on Samuel. Thankfully, this is paint that you can just wash off, and I think I’ve got rid of it all. And moved the box of drawing material into the garage. I guess at least it’s an accident (he was just trying to amuse himself by drawing) rather than deliberate (‘if you won’t let me out then I’ll draw on everything’) while he’s this age. 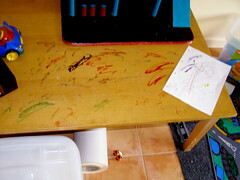 Posted in Uncategorized.Tagged accident, drawing, failure, paint, sam, samuel, sleep.